The Commodore 64 computer system is coming back with current-day power underneath its classic enclosure. 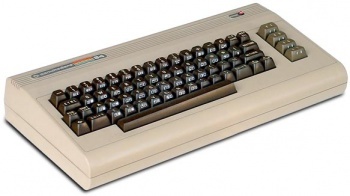 After computer manufacturer Commodore International launched the Commodore 64 in 1982, it quickly became a retail powerhouse and a landmark in gaming history. Thanks to its unique sound chip and computing power, a massive amount of games were created for the system, some of which that live on today through Nintendo's virtual console and emulation. The hardware will live on as well, sort of, as Commodore USA has announced plans to reintroduce the classic C64 chassis with modern day components stuffed inside for a product called the Commodore PC64. Commodore USA is taking their current business model of creating all-in-one products, basically laptops without screens, and reapplying it to the form factor that made them a household name even decades later. According to the press release, underneath the keys of the PC64 will be an Intel Atom 525 CPU with NVIDIA Ion2 graphics, 4GB DDR3 memory, a 1TB hard drive, HDMI, DVD/CD optical drive (Blu-ray optional), dual-link DVI, six USB ports, integrated 802.11n WiFi, bluetooth, and a 6-in-1 media card reader. While this seems like something that should have been done long ago, there were apparently rights issues that only cleared up recently. The Commodore 64 is said to have sold more than 30 million units, so anybody that grew up close to the 1980s likely messed around with one either at school or at home. The PC64 will be a way to relive those classic memories, uncomfortable typing position and all. Now if only someone can get the rights to the C64 Batman game with the greatest music ever for a re-release, it'll be just like the real thing.